A few posts back, I told you about birthday cards I made for our friends twin boys 22nd birthday. Well, today is another card for one of them. Chris has long had the goal of becoming a veterinarian. He pursued that by attending Berry College and graduating with a pre-veterinary degree. But, getting into vet school isn’t a guarantee, even for kids who’ve done well and done all they could. So, he worked even harder – he took another course in Bio-Chemistry over the summer after he graduated. He worked as an unpaid tech for a large animal vet, upping his “cred”. And, a week or so ago – all that hard work paid off. He was accepted at his school of choice, University of Georgia, up in Athens!! We were all SO excited for him – and Wayne and I are as proud as if he were our very own son and we’d had ANYthing to do with his success! So, I started working on a card for him. I started with sketch #94 from Sunday Stamps. And, I liked it! I love Blue and Silvery/White together, and I liked the pop of yellow from the Daffodil Delight. And…..wait! Cue the sound of mental brakes just a-screeching! This kid is going to UGA – not the Air Force Academy! UGA colors aren’t Blue and Silvery/White. They’re RED. And BLACK. Duh! What was I thinking? Can you hear the little voice saying….she wasn’t THINKING at all!?! She was just merrily coloring and stamping and cutting and…. So, I perused my stash and, quick-like-a-bunny, submitted an order for some inks and card stock in Real Red…..and then I waited. And, once it arrived, it turned into this! It’s Red and it’s Black and I like it a lot! Especially my oh-so-clever typed circle….but, more about that later! I used a piece of polka-dot Irresistibly Yours DSP (Sale-a-Bration), that I sponged with Real Red. I just kept adding ink until I decided it was UGA-red enough. The side strips started with a piece of Whisper White CS, that I embellished a little with my brand spanking new SU Finishing Touches Edgelit die – run thru the Big Shot. Note to readers: these Edgelits are quite cool – but, you REALLY need the Magnetic Platform when you’re using them – or it’s awfully hard to keep them right where you want them to be! I lightly sponged the cut edge – I left one edge straight. I don’t know why. But straight just seemed right…. A strip of Real Red CS, SNAIL’d onto the white added the additional stripe of the sketch. I finished that part with a piece of Basic Black Baker’s Twine and a little bow. Then I SNAIL’d the Card Front onto a piece of Basic Black CS, and put that on a Real Red card base with Stampin’ Dimensionals. For the circle sentiment, I first pulled out my Typeset DSP. But, it just didn’t strike me as the right thing. Then, I thought – hey, this needs to be veterinary terms! So, I looked thru my books and decided I wasn’t willing to cut any circles out of them (and no, I couldn’t like….COPY a page and THEN cut out the circle – no, way too KISS – Must. Do It. The. Hard. Way!). Then, a lightning bolt struck me. I went onto the UGA vet school website and copied/pasted the names of some of the courses Chris will be taking in the next four years (and if there was no other reason on the planet that I’m NOT a vet – some of those course names would certainly have given me pause). I hemmed and hawed over font and size and color and spacing and and and…. yes, I spent a LONG time on this piece! I finally printed it out and cut it with a Circle Framelit die. Then I sponged it in Real Red. And layered it on a Real Red mat, that I “stitched” with my white gel pen. Here’s a close-up. Admit it – it’s pretty durned personalized! I love it. And, find myself amazed that I came up with the idea! I stamped it in Black on Real Red and then fussy cut it out, SNAIL’d it to a piece of Back CS and fussy cut a mat. It’s popped onto the card front with Stampin’ Dimensionals. To finish it off, I cut a few Real Red stars out with the Itty Bitty Punch Pack and attached them to the front with glue dots and then finished them off with some large rhinestones. For the inside, I cut out a bunch of stars from a scrap piece of black CS and then used some Multi-Purpose Liquid Glue to attach that to a scrap strip of Real Red (oh, I’m so thrifty!). And then that went onto my Whisper White CS for the liner of the card. I finished it off with a sentiment from the Crazy for You set – first I stamped “So Proud of” and then I stamped the “You” – all in Real Red (definitely sticking to the color theme, huh?). And that’s that. One each UGA-themed congrats-on-getting-into-vet-school card. Here’s where I point out that, of course, this could be personalized with any school colors and any degree-goal-specific text. I also helped the envelope a little – here’s the complete ensemble. That’s some more of the Irresistibly Yours DSP, colored with Real Red ink. That’s such a great stack of paper – lots of different patterns that can be any color you like! I SNAIL’d it to the envelope flap and then trimmed it to fit. I’m off to put this in the mail for Chris. It’s past time to get this to him. I’m pretty sure Miss Manners would say that the time period has expired! Still a few more days left in this week’s weekly deals. Don’t miss out! For those of you following me on this blog (thank you! ), there’s likely to be a bit of a gap in posts. I’m headed to CA for several months on business, and it’s going to take me a minute to get my Stampin’ stuff mailed out there and set up to make cards (I’m NOT the only person who carries stamping gear around with her on business trips, right!?!?). Please be patient and don’t give up on me! 🙂 I’ll get back in gear just as quickly as I can. Backorder Report – as of 12 Feb 15, the following items are on backorder; backordered items will be available on or before the date indicated. LOL! What did your husband think of that?!!? Thanks for the nice words, Amy! So special, Mary! The circle of class names is truly inspired! I’m sure Chris and all who see this will love it. And what a grand accomplishment for him! 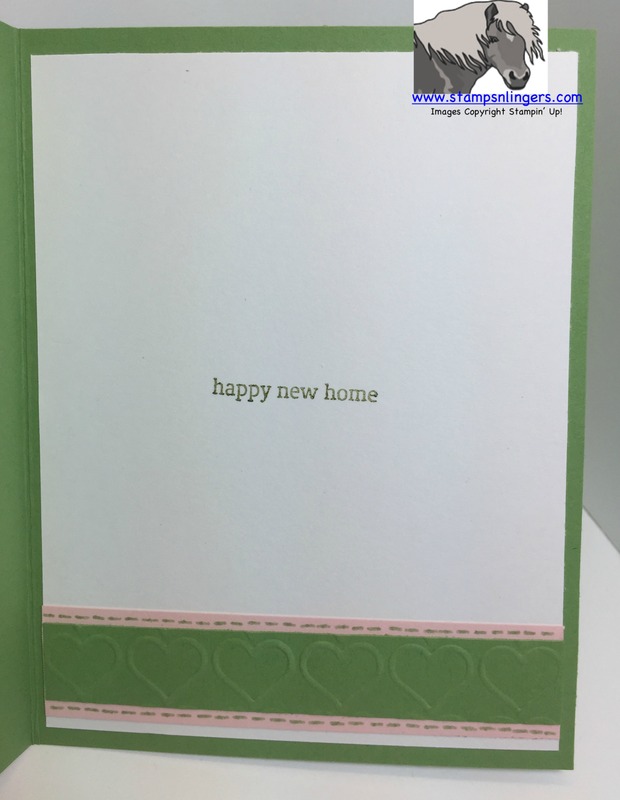 totally adorable, I love what you did with this sketch and your cards are so bright and cheery.